Are we looking at Strange Music’s latest signee? With the upcoming Gift Of Rap 2012 benefit show, Tech N9ne and Krizz Kaliko dropped into Fox 4’s Morning Show for a live interview segment to discuss the show and what people can do to help. Before closing out the interview, Fox 4’s Mark Alfonso stepped into the cypher with his own attempt at spitting that hot fiyah with Tech and Krizz- he even gets the Snake and Bat chain! 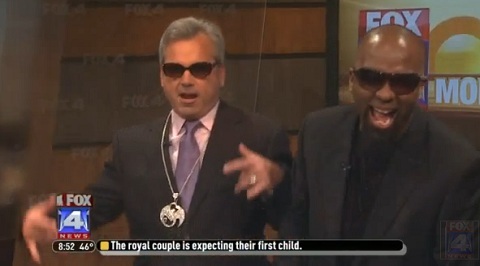 Check out the hilarious interview and don’t miss Tech N9ne’s Gift Of Rap 2012! CLICK HERE TO PURCHASE VIP PASSES TO TECH N9NE’S GIFT OF RAP 2012! Are you attending the Gift Of Rap?